Right now the garden is bursting with all manner of leafy greens. Lettuces, kale, spinach. Even the beet greens are beginning to cry for picking. SO many greens, so little time! This week we are still enjoying an overabundance of kale but also we are able to mix things up with the spinach that is beginning to take over. I am rather fond of spinach myself: for all my talk of loving growing and picking kale, I think I may actually prefer the spinach! 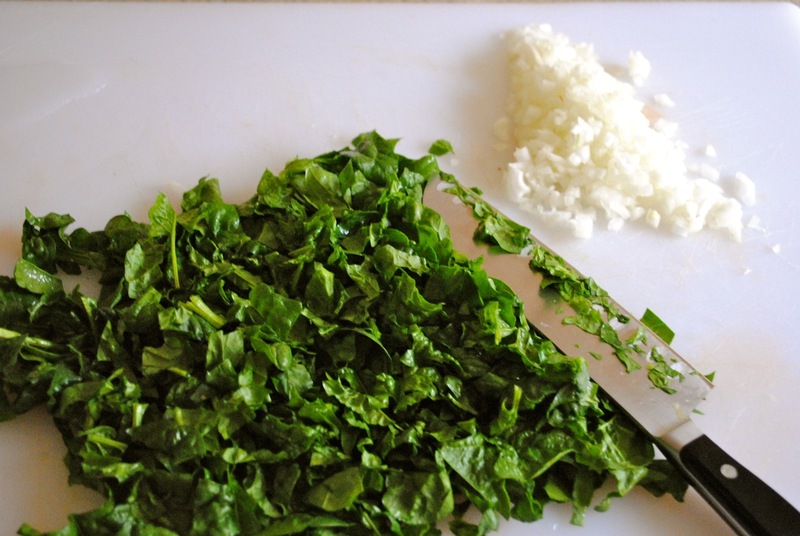 There’s an unending variety of things you can do with spinach: soups, dips, Spanakopita! I like to use fresh spinach in place of shredded lettuce in my tacos. 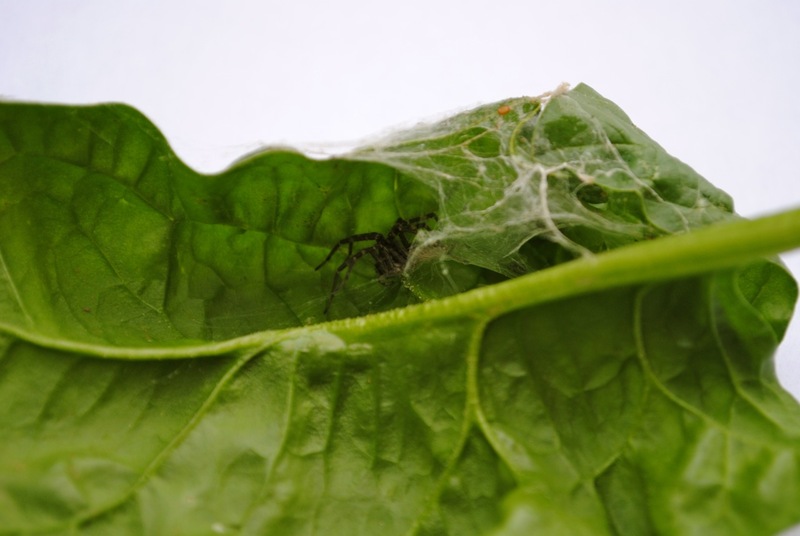 It does well in a regular ol’ salad, and even better in one with strawberries! 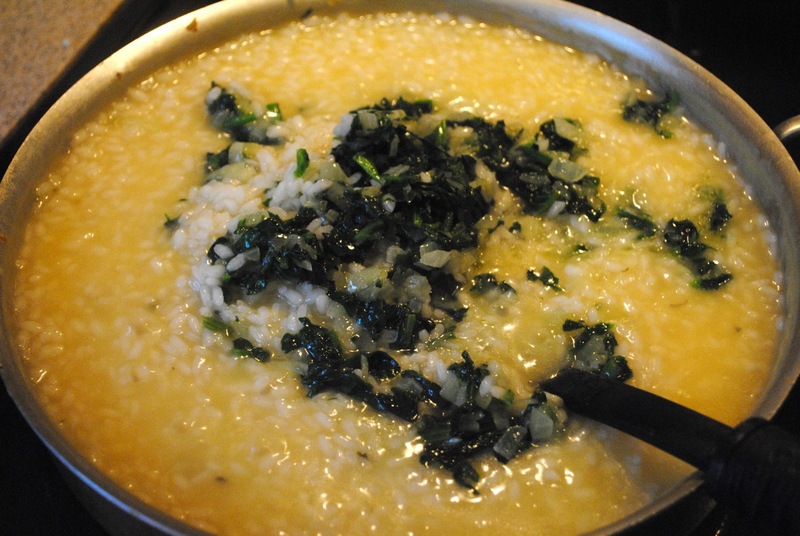 This week I made my go -to dish for any vegetable for which I have too much: risotto. 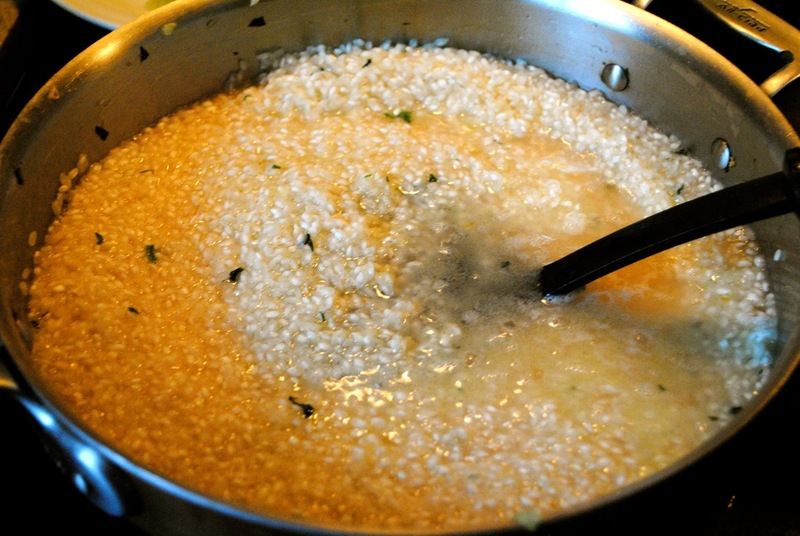 I am a sucker for risottos of all kinds, but my favorite is just a simple white wine and parmesan, plain – as – they- come risotto with some chopped up and sauteed veg thrown in. 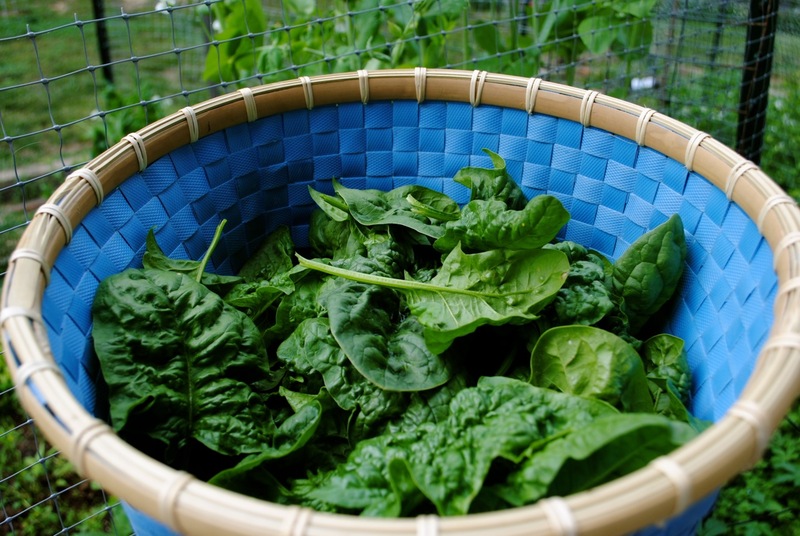 To start I gathered a large bunch of spinach from the garden – around the same size as those bundles you see in the produce section of the supermarket. They weigh probably around a pound. It looks like too much, but it cooks down and reduces A LOT. I like to thoroughly wash my greens, and not because they are dirty. In fact, I am completely sure the greens from my garden are far cleaner than those that have been picked in some other state, loaded onto a truck, driven for miles and miles, loaded onto display and handled by various shoppers. Yeah, you’d notice that big guy in your finished meal. 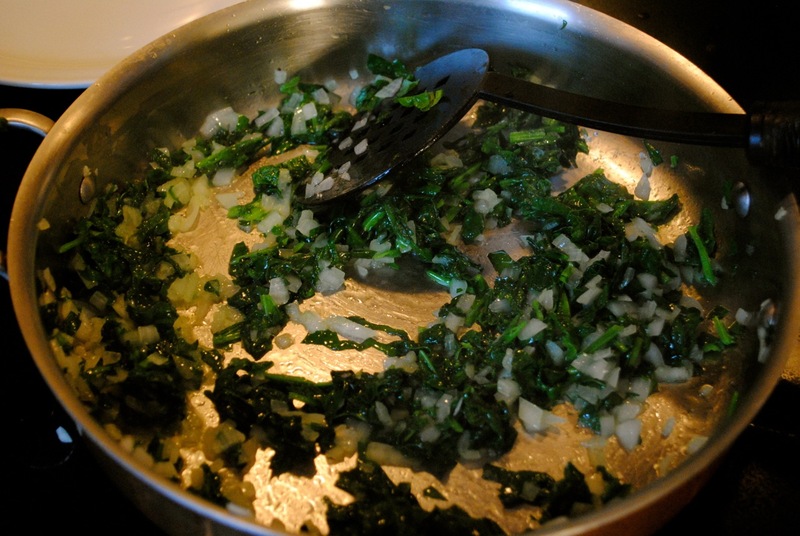 So – I thoroughly wash my spinach, and then chop it up with half a yellow onion. I saute the onion and some garlic in a bit of olive oil until the onion starts to become translucent, and then I add the spinach. 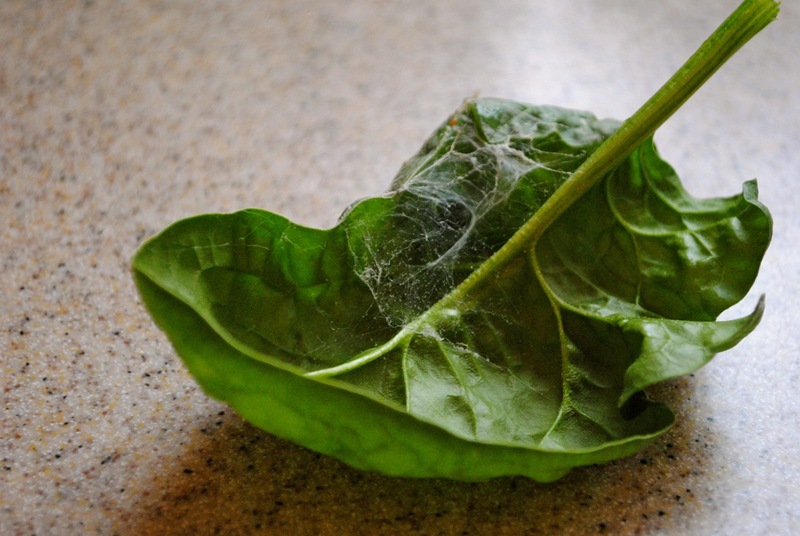 I don’t want to cook the spinach too long – just long enough to wilt it a bit and reduce it somewhat – then I remove it from the heat and transfer the onions and spinach to a warm plate. You don’t want to leave the vegetables in for the entire cooking time or they will overcook and lose a lot of their texture and character. We’ll throw them back in at the end. Meanwhile, I have a pan of vegetable or chicken stock simmering on the stove on low heat, waiting for its turn to be added to the pot. You want it to be hot when it is added to the rice or it will slow down your cooking time dramatically. You can use either kind of stock for this recipe – I prefer the richness of the chicken stock, but since my oldest is a vegetarian I tend to use vegetable stock whenever I can. Next I add a touch more olive oil to the pan that the spinach has just vacated and I add the dry, uncooked rice. The idea is to get it coated in oil and saute it for about 3 or 4 minutes – until it starts to become translucent-ish. Then I give it a good splash of white wine. I tend to be generous here. Here’s the thing about wine in cooking: I don’t use “cooking wine”. I use straight up, run of the mill, whatever’s on sale wine. I cook with wine fairly frequently so I always keep a couple of bottles of cheap whites and reds around. You don’t have to be as picky with it as you would if you were going to drink it (although sometimes even that super cheap stuff can be very drinkable!). Once the wine has mostly been absorbed into the rice you can start adding a bit of the simmering broth, a little at a time, waiting for it to be almost all absorbed before adding more. It should take around a half an hour to use up all of your stock and for the rice to become soft. It will start to look almost creamy, and then you know you are ready to finish it up. At this point you’ll throw your spinach and onions back in along with some parmesan cheese, salt and pepper. Honestly, I tend to add extra parmesan and leave out the salt. If you wanted to you could throw in some steamed and chopped asparagus at this point as well. Artichokes also make a nice addition. Okay, I am making myself very very hungry right now. Once everything is mixed in and heated through you are ready to serve. 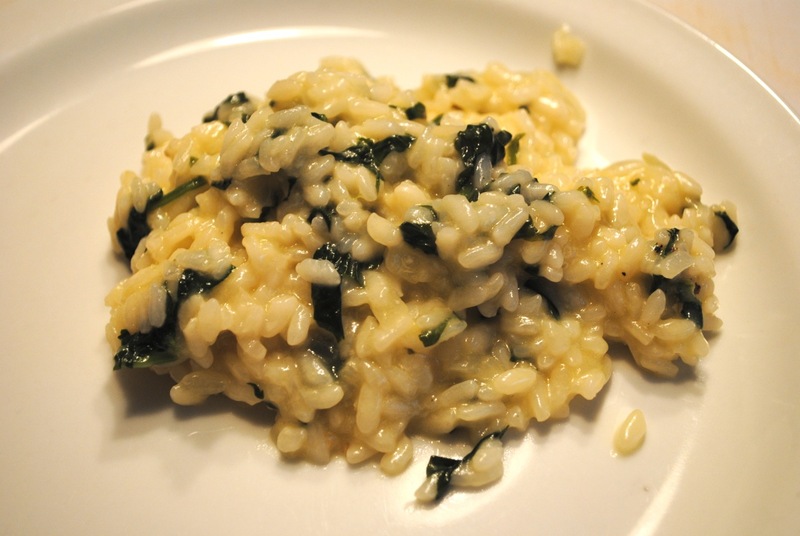 A nice and simple risotto like this can make a fine meal all on its own. Or you can add a fried egg with a runny yolk right on top and make it extra special! Oooh! You’re right – things that will go on my list to do!!!! Your spinach is beautfiul! 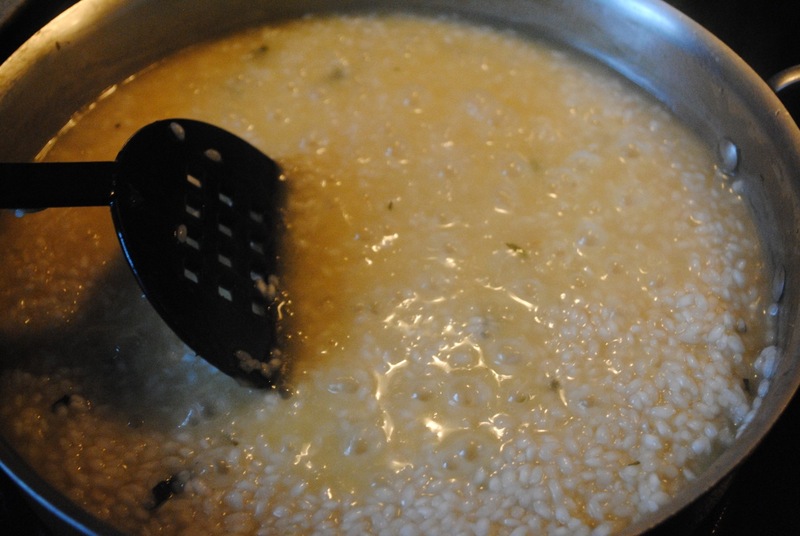 and the photos of your risotto in progress make me want to make some! Looks delicious.